In the early 1970s, after finishing my graduate work in public finance, a friend of mine asked me how I know what I know. My answer was that I know the answers to all of the questions I have been asked. I understood that to mean first that every question is important, and deserves a considered answer; and second, that what an economic analyst brings to any task is an accumulation of years of past experience. My role as an economic consultant is an extension of a lifetime of substantive work at all three levels of government, in the trade union movement and in the non-profit sector. This website is about what I have learned in the course of that journey. The goal of my work is always to add something to the debate; to offer something more than a repetition of arguments that everyone has heard time and time again. I have found that often the clearest way to make a point is with a picture or simple calculation, and on this page, you can see an example of the kind of image that emerges from the work I do. Here is my latest favourite. We hear a lot from conservatives about the growing size of government in Canada as they lecture us about the virtues of becoming more like Americans. At the risk of confusing them with facts, take a look at this picture, drawn from that well-known source of radical ideas, the Fiscal Reference Tables, Department of Finance, Canada. This shows the share of GDP represented by government outlays, and is not a bad representation of the relative size of government. Canada is the blue line; the United States is the red line. The share peaked at just over 50% in Canada in the 1991 recession. The share peaked in the US in the 2008 recession at just over 40%. 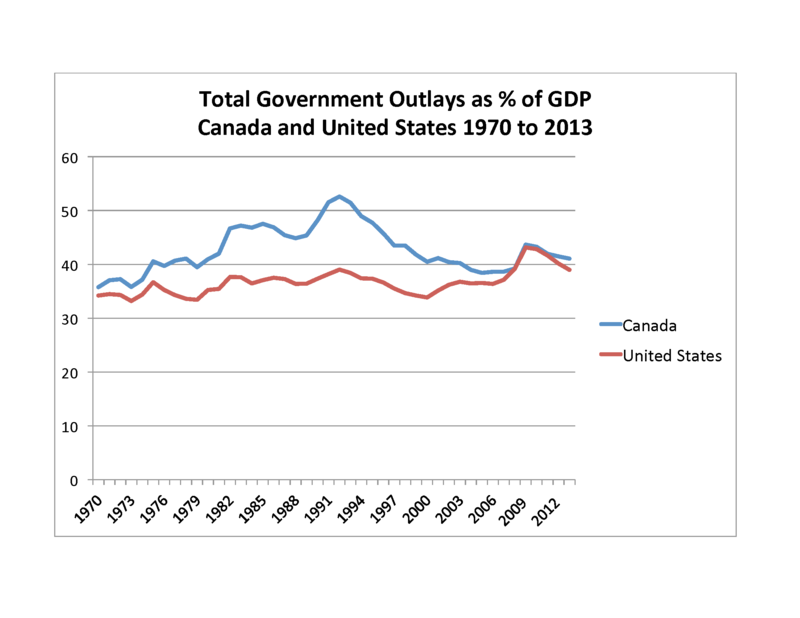 What’s striking is that government outlays as a share of GDP are now almost identical in Canada and the United States. What’s also interesting is how clearly one can see the effect of the likes of Mike Harris, Gordon Campbell, Jean Charest, Paul Martin and Stephen Harper on the public economy in Canada, as government outlays have dropped dramatically from the early 1990s. It is also interesting to see the irony in the steady decline in the United States under Clinton followed by the steady increase under Bush. Finally, think about this in the context of the other reality: government revenue as a share of GDP in Canada exceeds that of the United States, by a substantial margin. Evidently, Canadians and Americans share a similar desire for public services; the difference is that Canadians — at least so far — seem to be prepared to pay the taxes needed to pay for them; Americans appear not to be.